May 24, 1927 – The Chicago Daily Tribune reports that the Chicago Plan Commission has recommended joining the outer drive in Grant Park with Lake Shore Drive north of the river by means of a “link bridge” at the mouth of the Chicago River, a bridge that would “follow the classic architecture of the boulevard link and Wacker drive.” [Chicago Daily Tribune, May 24, 1927] James Simpson, chairman of the plan commission, says, “We have held conferences with a number of people interested … if this plan is approved, the actual physical work might start either late this year or early next year, and the project be completed by 1929.” The plan is to start the road at Randolph Street, building a 140-foot wide raised thoroughfare above the Illinois Central railroad yards straight to the mouth of the river where the road will curve east to become an extension of Wacker Drive. The new bridge would carry traffic north to a point just short of the Furniture Mart, today’s 680 Lake Shore Drive, where the new road will join the existing Lake Shore Drive. It is a plan that will take, not one or two years, but ten years to bring to completion. The 1909 photo above looks west to the mouth of the river where the bridge will come to stand in 1937. 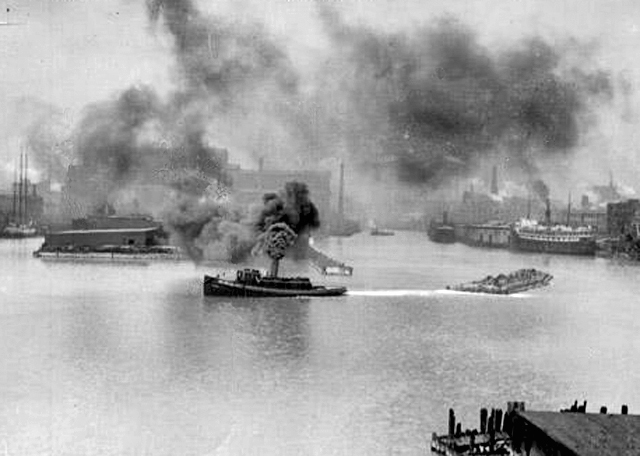 May 24, 1954 – The Illinois Supreme Court rules that Chicago may proceed with construction of its 96 million-dollar water filtration plant just north of Navy Pier. Near north side property owners are huddling to determine whether to ask for a rehearing or take the case against the city directly to the United States Supreme Court. In his opinion Judge Harry B. Hershey finds that the 85-acre filtration plant will not be an “unreasonable interference” to navigation and will not violate an 1891 series of contracts in which lake front property owners gave up their rights to submerged lands with the understanding that the park district would use the property for park purposes. The court finds that the property in question is beyond the 250 feet over which the park district has control. “. . . the reclamation of this submerged land and the construction of a filtration plant thereon can constitute no violation by the park district of its covenant with the property owners,” the court’s opinion states. 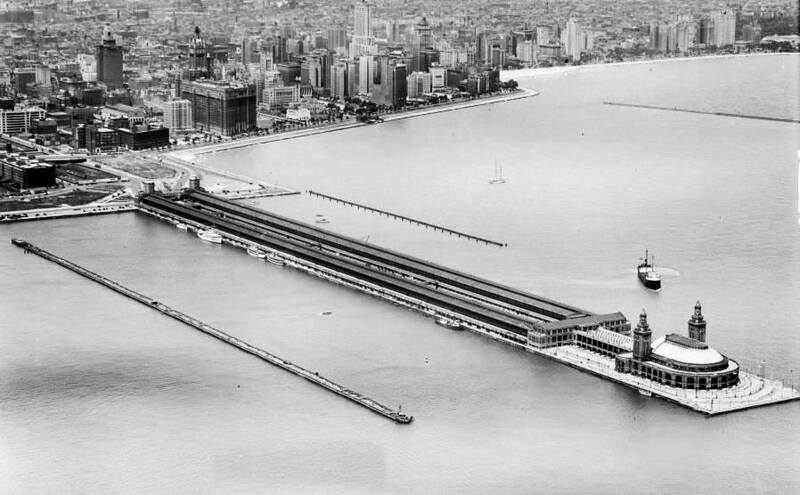 [Chicago Tribune, May 25, 1954] In the above photo to the right of the long Municipal Pier, today's Navy Pier, extending out into the lake is the location of the site of the proposed water purification plant. It took nearly a half-dozen years of court battles to get the project finally prepared for take-off.